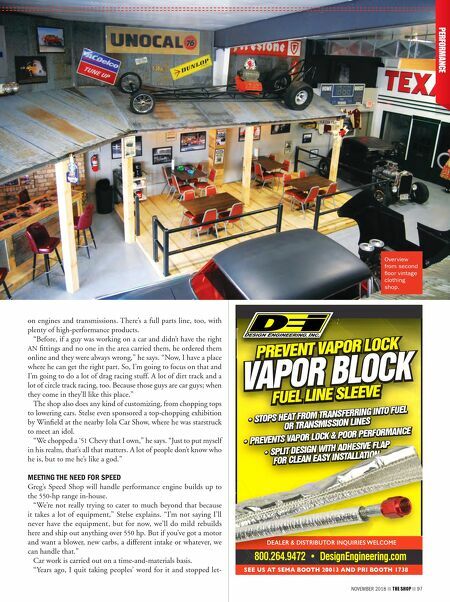 96 THE SHOP NOVEMBER 2018 drag racer), a hot rod, authentic oil com- pany signs, a fabricated replica of a 1940s Pontiac dealer sign, a gas pump and other automobilia decorate the main building. Behind the Texaco station façade is a spiral staircase that leads to a photo studio with 1960s living room furnishings. On the other end of the upstairs level is a seamstress area and an office. Greg built all of this himself. The front of the main building was redone with century-old brick that Greg trucked home from Chicago. By coincidence, an old phone booth he purchased also came out of Chicago. Adjacent to the main building is a large, new steel building that he put up late last fall. 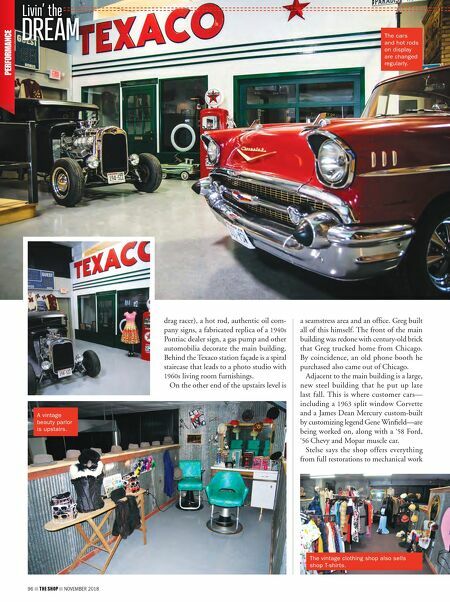 This is where customer cars— including a 1963 split window Corvette and a James Dean Mercury custom-built by customizing legend Gene Winfield—are being worked on, along with a '58 Ford, '56 Chevy and Mopar muscle car. Stelse says the shop offers everything from full restorations to mechanical work The cars and hot rods on display are changed regularly. A vintage beauty parlor is upstairs. Livin' the DREAM The vintage clothing shop also sells shop T-shirts.